A wilderness of forests, grasslands, and mountains tamed by a diverse group of settlers long ago, Prismal is the thriving independant kingdom where Court of Roses takes place. They enjoy a strong alliance with the Goliaths of the Vermilion Mountains to the north, and have just begun talks to join an alliance with the Aravae Isles to the southeast. Prismal itself is split into eight provinces, most of them with their own Duke presiding over the region from their castle city. Some provinces have more major cities than others (major cities are marked with a tall tower on the map, indicating their temple), but they all offer different cultural and practical signifiances to the kingdom, listed under the map below. The Hearthlands are the center for royal family meetings, most religious gatherings, and an ideal locale for old families to settle. The plains between settlements are widespread and rather sparse. Umberglow is the center of science, knowledge, and various forms of study. Due to the high concentration of medicinal plants in and around the province, including the neighboring forests and swamps, the Prismal Alchemist Society make their home here, in Calcin. Mulberry is the center of the arts, in all its forms. Each city has its own artistic focus, but the major cities of Saung and Mapleton are the most traversed, the former being the epicenter of music and the latter being the same for artwork and writing. Greyrock is the center of craftsmanship, in the forms of smithing, tinkering, and so on, aided by the laborers of the mountain mines. As a neighbor to the Goliath clans, physical prowess is also honed here, in the arenas of Highsborough and even by the monks of Mt. Serene. Flaxenbrook is the center of foreign trade and commerce, as its own castle city is Port Terquoi, the major port leading to the Indigo Sea. Much of the saltwater fishing trade is also conducted here, and salt itself is harvested from the wetlands. Greenwind is the center of agriculture, in both raising crops and cattle, as the plains here are most fertile. Many hunters and trappers are permitted to ply their trade on the borders of the Tree-Sea as well. Port Gem also offers passage across the Golden Bay to the Aravae Isles. The Emerald Tree-Sea is where all who follow the Old Ways of Nature commune, and is not easily traversed. The elves of Durmista offer pathways and guidence through the forests for travelers, but some of the Old Magics have spawned numerous dangers hiding in the deep glens. Black Hollow only exists as a protective gateway to the Southern Swamps. Its lands are barren, as if slightly tainted by the swamps, and its few inhabitants guard the Sienna Wall outside of Blackburn; sometimes, they are posted at the Sienna Gate in Umberglow. Humans, the round-eared diplomats and laborers. 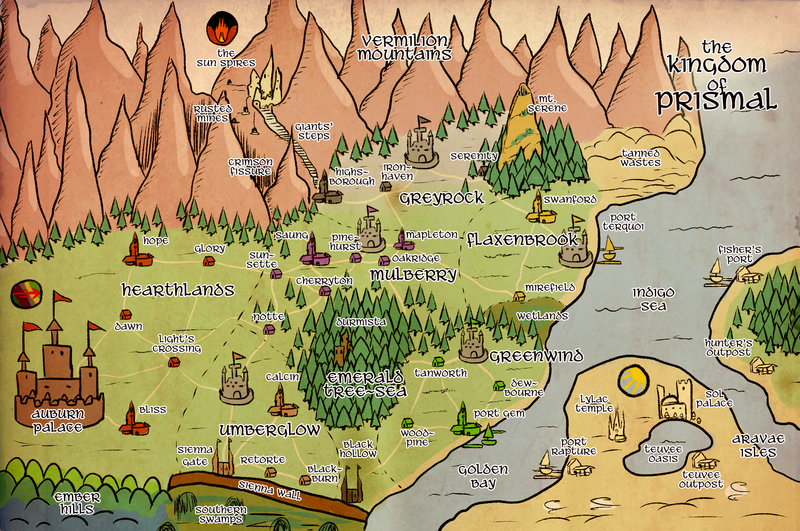 Most have settled in the Hearthlands and farms of Greenwind. Elves, the point-eared practioners of the Old Ways of Nature. Many, but certainly not all, have settled in Durmista to devote themselves to Jayd. Gnomes, the short-statured champions of science and the arts. Many make their homes in Mulberry and Umberglow. Dwarves, the stout, bearded builders and crafters, some say the original architects of each city. Many settle in Greyrock. Orcs, the once inhabitants of the harsh Southern Swamps, but now thrive across all of Prismal. They oversaw construction of the Sienna Wall. Goliaths, the giant rulers of the Vermilion Mountains. Most that settle in Prismal remain in Greyrock. Sphynx, the felines from past the Southern Swamps. A prominent Sphynx family owns most of the wetlands in Flaxenbrook. Argusas, the canines also from past the Southern Swamps. They arrived with the Sphynx, but settled all throughout Prismal. Baskaas, the reptiles from parts unknown. Most have settled in the warmer climates of the south, especially in Greenwind, closer to the Golden Bay. Malarks, the birds from parts unknown. Long ago, they migrated across Prismal from the east. Some continued past the Indigo Sea, others settled throughout Prismal. Infernals, the least understood people of Prismal. Demonic only in appearance (though lacking in claws and fangs, and sporting antlers as opposed to horns), there are conflicting stories of where they originated from. They share a name with the Infernal Realm, the plane of demons where most of those stories begin. ​NOTE: Mixed-race people are quite common, and are liberal with how they refer to themselves. They use terms such as half-elf, half-dwarf, half-sphynx, etc. Pal'let, creator of all, parent and ruler of gods. Depicted as a grand humaniod as blank as a canvas. Scarlette, goddess of love, beauty, betrayal, and revenge. Depicted as a woman whose appearence changes based on who views her, always with roses. Citron, god of fire, battle, adventure, and courage. Depicted as a gargantuan goliath warrior. Tawni, goddess of light, luck, and fortune. Depicted as a free-spirited and unpredictable fey. Jayd, goddess of earth, nature, hunting, and agriculture. Depicted as a flowering tree-woman. Syan, goddess of wind, air, and the sky. Depicted as a woman with hair made of clouds, shifting in type based on the weather. Navee, goddess of water, rain, storms, and the sea. Depicted as a woman who is fishlike until the winter, when she dons a thick white coat. Indeego, god of knowledge, magic, and secrets. Depicted as an old man with an expansive library. Lylac, god of mirth, joy, and all creativity. Depicted as drunken bard with a lute. Mahve, goddess of birth, fertility, and marriage. Depicted as a loving woman in purple robes with a family of doves. Hazil, goddess of home, family, and community. Depicted as a hearty housemaid with an entourage of rodents. Sabal, goddess of death and caretaker of souls. Depicted as a woman with feline features and her black cat followers. Every major city has a temple dedicated to each of the gods, and their specific god influences the city's style and social gatherings. Exceptions are Sabal, who is worshipped at every temple through their burial halls, and Pal'let, who is represented everywhere regardless. Prismal's calendar has twelve months, with 31 days each. Each month is dedicated to one of the twelve gods, with a holiday celebrating them throughout the month.